January 21, 2016 – Images from NASA’s Solar Dynamic Observatory (SDO) show magnetically active regions on the sun on January 8-9, 2016. 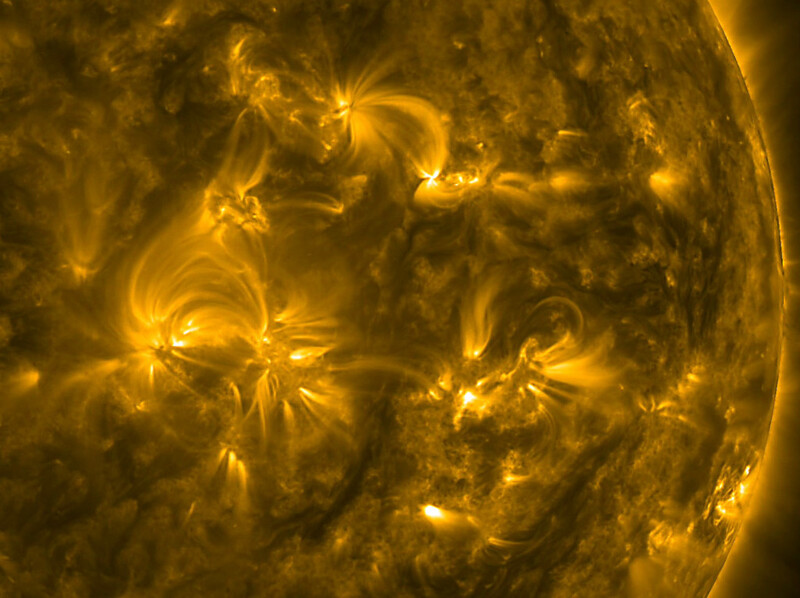 When such regions are close-set, magnetic field lines create a tangle of arches snaking through the solar atmosphere. Those tangles are visible in the video below because charged particles spin along the magnetic field lines, emitting extreme ultraviolet light observable by SDO. Watch the video to see how the magnetic field lines are constantly connecting, breaking apart, and reconnecting among the several active regions – a robust illustration of how dynamic the sun is. This video was captured in extreme ultraviolet wavelengths of 171 angstroms. Though typically invisible to human eyes, the extreme ultraviolet images are colorized here in gold. The University of Colorado at Boulder’s Laboratory for Atmospheric and Space Physics (LASP) provided and manages mission operations for the Extreme Ultraviolet Variability Experiment (EVE) on SDO, which is responsible for acquiring images of the sun in the extreme ultraviolet lengths. Goddard Space Flight Center built, operates and manages the SDO spacecraft for NASA’s Science Mission Directorate in Washington, D.C. SDO is the first mission of NASA’s Living with a Star Program. Data from all three SDO instruments are used by the NOAA Space Weather Prediction Center in Boulder, Colorado to create space weather forecasts.